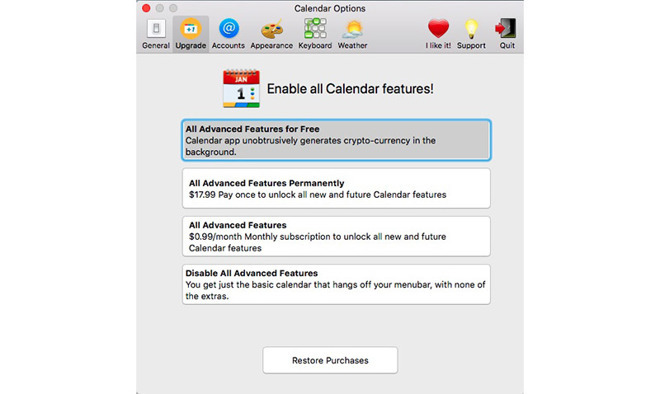 Popular Mac app "Calendar 2" recently added a "payment" option that uses customer computers to mine the cryptocurrency Monero in exchange for free access to premium features, but a bug in the app's code allowed the miner to run indefinitely even when users opt out of the default setting. As outlined by ArsTechnica, Calendar 2 developer Qbix integrated an xmr-stack miner that runs when users agree to default terms. Specifically, users are presented with a dialog box that notes the app dedicates CPU cycles to mining digital coins in return for access to premium features. Though set as the default option, customers can elect to pay a one-time fee or subscription rate to unlock all premium features. Alternatively, users can access a version of the app without any extras for free. Unfortunately, Qbix founder Gregory Magarshak in a statement to the publication said the mining rollout has run into two issues, the first being a bug that caused the miner to run even when the default setting was not selected. A second flaw allows the miner to consume more than the designed 10 to 20 percent of a host Mac's CPU duty cycle. Apple failed to respond to requests for comment on Calendar 2's mining activities, specifically whether they breached App Store terms of service, and allowed the app to remain on the App Store. The company's guidelines are largely undefined when it comes to cryptocurrencies, and there appears to be few contingencies in place for strategies like the one put in place by Qbix. In response to the report, Magarshak decided to remove the mining function from his app, citing problems with the miner's source code, the feature's buggy launch and a personal distaste of "proof of work" computing. 2) The rollout had a perfect storm of bugs which made it seem like our company *wanted* to mine crypto-currency without people's permission, and that goes against our whole ethos and vision for Qbix. 3) My own personal feeling that Proof of Work has a dangerous set of incentives which can lead to electricity waste on a global scale we've never seen before. We don't want to get sucked into this set of incentives, and hopefully our decision to ultimately remove the miner will set some sort of precedent for other apps as well. Ultimately, even though we technically could have remedied the situation and continued on benefiting from the pretty large income such a miner generates, we took the above as a sign that we should get out of the "mining business" before we get sucked into the Proof of Work morass of incentives. Following the report and subsequent statement from Magarshak, Calendar 2 is no longer available for download on the Mac App Store. Whether it was Apple or Qbix that pulled the app is unknown.